April 12th, 2015 Outside the Holy Toaster, USA. 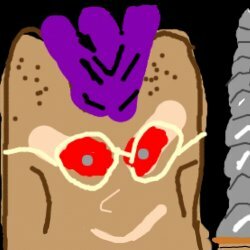 Toasty_Tyrant has drawn 262 drawings and authored 1,248 captions across 1,510 games. They follow 40 players and have 24 followers. They've earned a total of 2,808 emotes! You have a yellow "Minion" in yer heart. 2 horned anime girls. One dead, one shocked. Portuguese blob laughing in subtitles. Oops. I just destroyed the universe, oopsies.